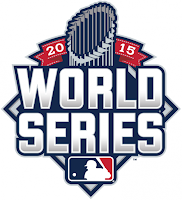 Tuesday October 28th 2015: 2015 World Series Game #1- Kansas City Missouri. 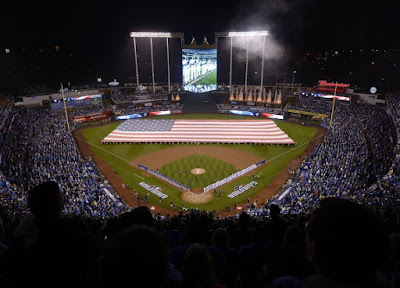 The surprising National League Champions, Terry Collins New York Mets came to Kansas City to face Ned Yost Royals, who were making their second straight trip to the Fall Classic. The two teams came in matching up very evenly. The Mets known for their strong starting pitching day in & day out. An outstanding closer & power with the bats. The Royals a strong bullpen, good defense, speed & a strong line up one through nine. 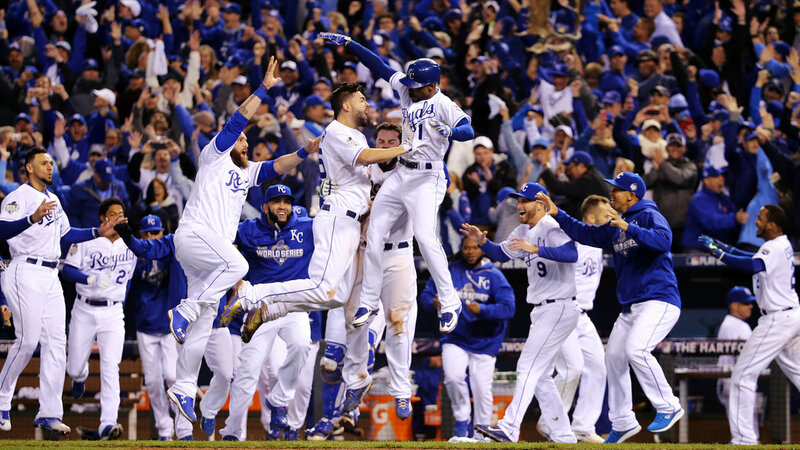 The Mets have not won a Championship since 1986 & the Royals sine 1985. Some ones drought would be over after this series. The Mets sent Matt Harvey (13-8 / 2.71 ERA / 189 Ks) Post Season (2-0 / 2.84 ERA) to the mound against the Royals; Edinson Volquez (13-9 / 3.55 ERA / 155 Ks) Post season (1-2 / 4.32 ERA). 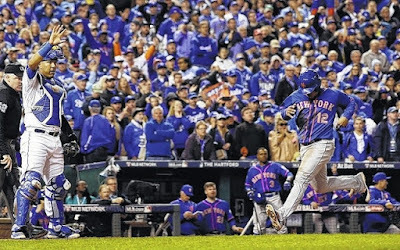 As Matt Harvey threw the first pitch to open up the 2015 World Series, Alcides Escobar drilled a shot to left centerfield. Either Yoenis Cespedes didn't see it or just misjudged horribly, it dropped between him & Michael Conforto. The speedy Escobar rounded the bases for the first inside the park HR since the very first batter of the very first World Series in 1903. Note: In the 4th inning FOX lost its main & back up generators causing a power outage. This led to the loss of the television feed & the audience lost one at bat. The game came back with the international feed until FOX recovered in the 6th inning. Both Managers agreed to play during the outage even though New York lost its feed to review replays. Trivia: In the 4th inning Daniel Murphy continued his hot hitting as he singled to center field. He set a franchise record with 17 post season hits & has now hit safely in ten straight post season games. 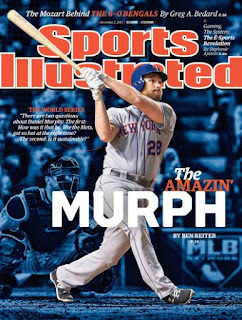 This week Murphy also made the cover of the World Series preview issue of Sports Illustrated. Then with one out, the Royals put the shift on to the right side for Lucas Duda. Duda found a hole and singled to right, with no one at third base, Murphy raced to third base putting runners on the corners. 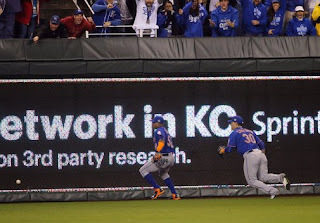 Travis d'Arnaud then got an infield single to third baseman Mike Moustakas, scoring Murphy with a nicely designed run. 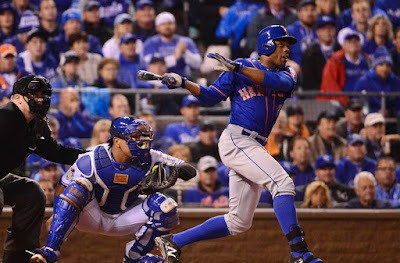 In the 5th inning Curtis Granderson lined a solo HR to right field, putting the Mets up 2-1. 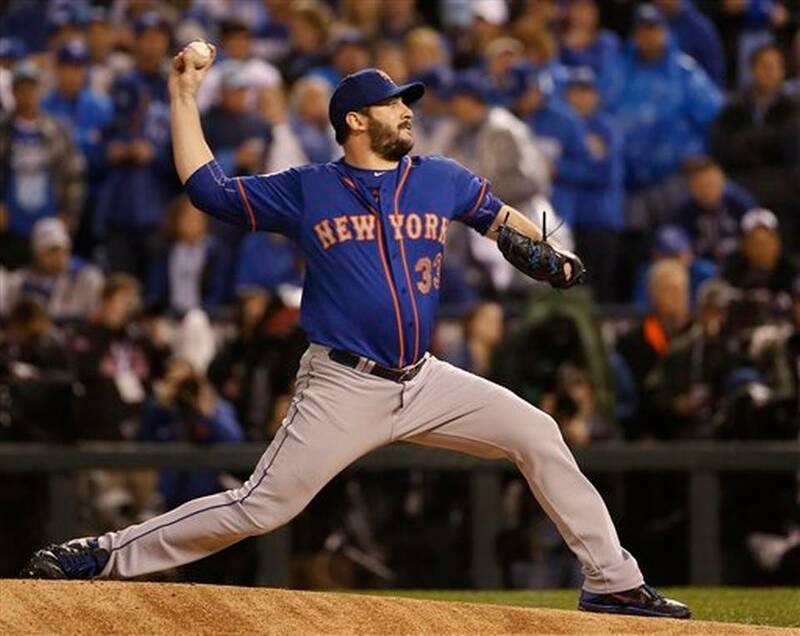 It was the first HR of the 2015 World Series as the Grandyman continued to deliver. Later in the game he made a spectacular catch in right field saving the game up to that point. In the top of the 6th, Cespedes led off with a base hit. The Royals put another shift on Lucas Duda & he singled again, this time in a hole, deflecting off Ben Zobrist. Again with the shift on, Cespedes was able to take third. Two batters later, the youngster Michael Conforto hit a sac fly to left. 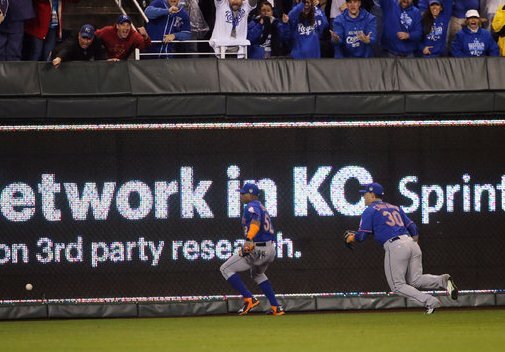 The strong arm of Alex Gordon could not throw out the speed of Yoenis Cespedes. The Mets went up 3-1. 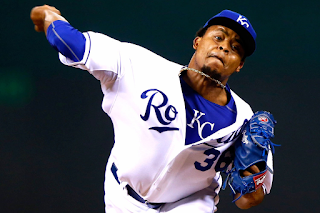 Royals starter Volquez left after six innings allowing three runs on six hits, one walk & three strike outs. Sadly after he exited he learned of his fathers death that had occurred early in the night. His wife chose to to tell him so he could start the game with out that on his mind. On the Mets mound, Matt Harvey had settled in nicely after the 1st inning, making a great adjustment throwing more off speed stuff. In the 6th he ran out of gas, Ben Zobrist jumped on a first pitch & doubled to right. Lorenzo Cain singled, but Zobrist was held up at third. Eric Hosmer then hit a sac fly scoring Zobrist making it a 3-2 game. With two outs, Mike Mostakas brought in the tying run with a base hit. In the 8th Juan Lagares hit a two out single & stole second base. Wilmer Flores then chopped a shot to two time Gold Glover Eric Hosmer who let the ball go off his glove into the out field. Lagares scored putting the Mets up 4-3. Tyler Clippard gave up a lead off double in the 8th, then struck out the next two batters. 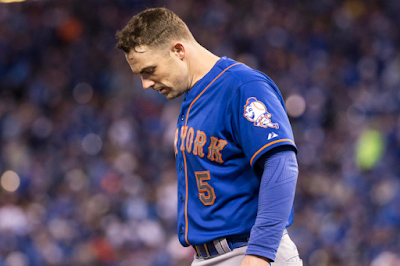 He walked Kendrys Morales & was removed by Manager Terry Collins. Jeurys Familia got the final out as Moustakas grounded to short. In the 9th the Mets had the Royals where they wanted, having a lead & the ball in Familia's hand. But Familia gave up the first HR he had given up in three months, as Alex Gordon homered. The game went to the 14th, as Jonathon Neise gave the Mets two good innings of relief & the Bartolo Colon came on. He got out of a bases loaded jam in the 13th but not in the 14th. 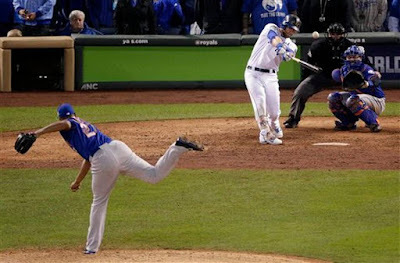 A David Wright throwing error started it, Zobrist then singled & Lorenzo Cain was intentionally walked. A sac fly by Eric Hosmer scored Alcides Escobar with the walk off winning run. The Mets offense only generated one hit after the 9th inning, a bunt base hit by Juan Lagares. Chris Young made his old team look ridiculous as he earned the win, he struck out four Mets in three innings giving up no hits. 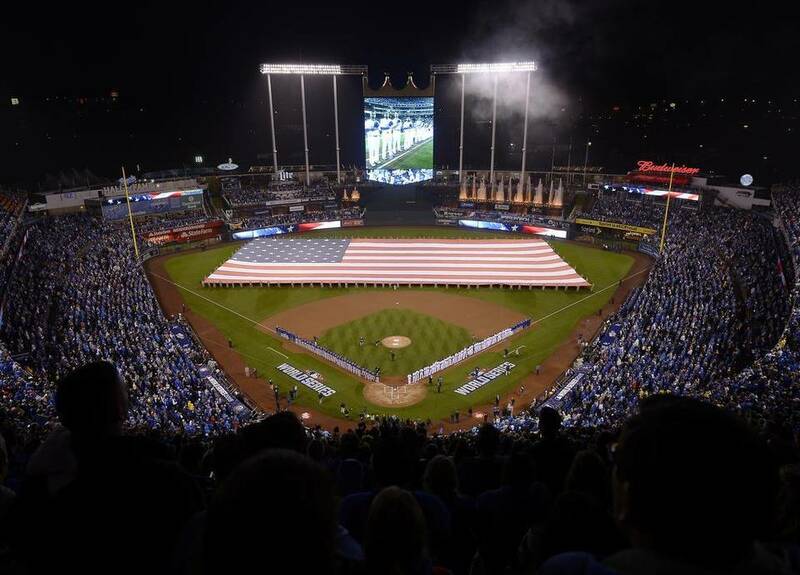 Trivia: This was the longest Game #1 in World Series history. 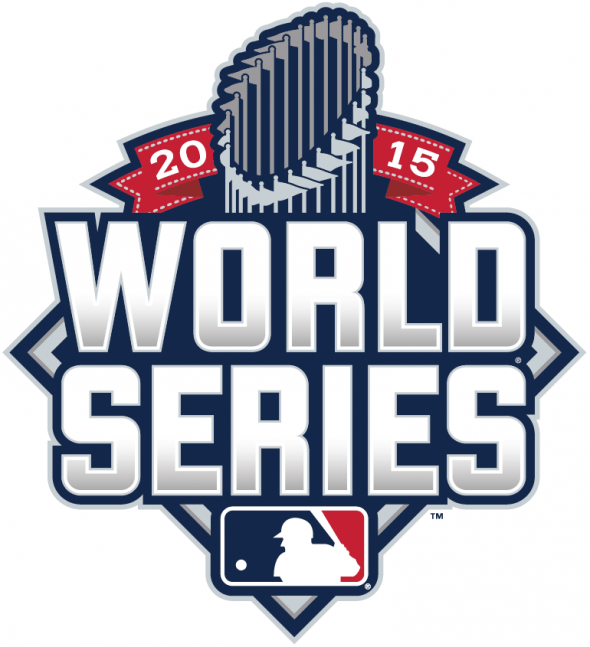 Trivia: The Mets have lost Game #1 in every World Series they have ever played in.